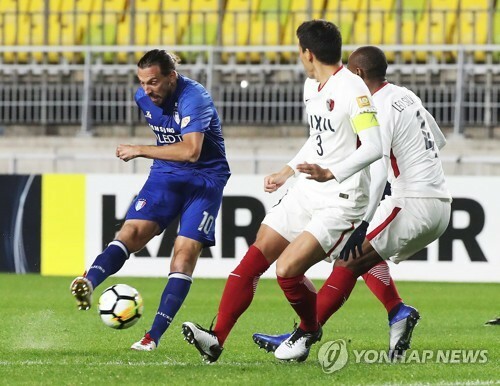 Suwon Samsung Bluewings striker Dejan Damjanovic leveled the all-time scoring record of the premier Asian club football tournament after netting a goal against Kashima Antlers on Wednesday. Damjanovic was one of the goal scorers in Suwon’s 3-3 draw with Kashima in the second leg of the Asian Football Confederation Champions League (ACL) semifinal match at Suwon World Cup Stadium in Suwon, south of Seoul. But despite his goal, Suwon failed to advance to the final as they lost to Kashima 6-5 on aggregate. Damjanovic scored his 36th ACL goal in the 60th minute. With Suwon leading 2-1, he took a pass from Jang Ho-ik in the box and found the net with his right foot. With his latest goal, the 37-year-old Montenegrin matched Jeonbuk Hyundai Motors striker Lee Dong-gook’s scoring record at the ACL. Lee was unable to increase his goal tally after Jeonbuk were eliminated in the quarterfinals by Suwon. Damjanovic also stepped up as the second-best scorer in this season’s ACL with Youssef El-Arabi of Al Duhail SC. The two finished the tournament four goals behind Al Sadd’s Algerian forward, Baghdad Bounedjah. Damjanovic is arguably the best foreign striker to ever play in South Korea. He is the first player to win three consecutive scoring titles, doing so from 2011 to 2013. In 2012, he was named the league MVP. Damjanovic made his K League debut with Incheon United in 2007, but he spent most of his career in South Korea with FC Seoul. He moved to Seoul’s arch rivals, Suwon, this year.